“The accelerating bull market in copper, which is facing a stagnant supply base amid rising demand, lifted pre-tax profits at Freeport-McMoRan 46 per cent to a record $8.5bn last year. US-based Freeport, the largest publicly traded producer of the red metal, offered the first indication on Thursday of the financial bonanza that the big copper miners were enjoying. 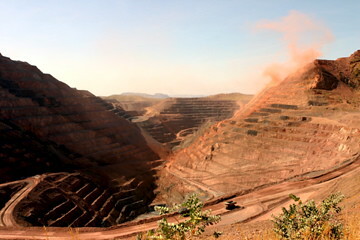 The New York-listed company published its annual results ahead of Rio Tinto, Anglo American and Xstrata, other copper miners expected to unveil similar windfalls from copper. Reuters notes that the share price of Freeport is falling behind on copper future price since February of this year. FCX currently expects capital expenditures to approximate $2.5bln for the year 2011. Still the company is turning out a special dividend worth almost $500mln. The results of the company missed the analysts estimates, resulting in drop of the stock price. The main reason for dissatisfaction is the decrease in production to 3.14bln pounds. Production is expected to increase by over 20% in 2011. The company does not appear to have more growth options at the moment, returning excess cash back to shareholders instead of investing above the planned $2.5bln. Country risk of Congo, where the Tenke Fungurume project is located, will cause the production outlook to remain uncertain. Freeport has signed a deal with the government in October that appears to be promising. However, 2011 will have to prove the stability of the deal.